UMAC prides itself in maintaining an in-house fleet of delivery trucks, unlike our competitors, to ensure that your boxes get to your loved ones safely and efficiently. We are the trusted shipping partner of your friends and family abroad. UMAC started in 1988 as the pioneer in the freight forwarding industry under the name Forex Cargo. In 2003, our company grew and this gave birth to the name UMAC. 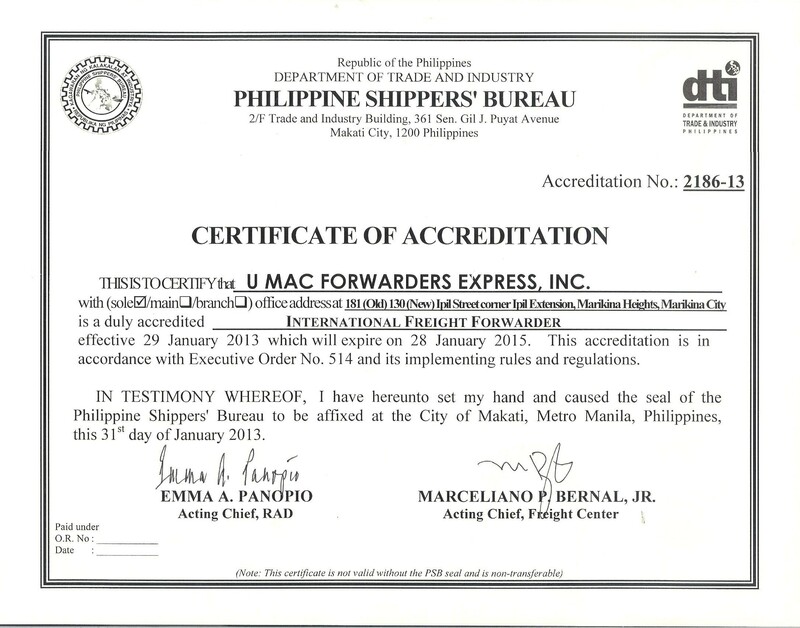 UMAC FORWARDERS EXPRESS, INC. is named after our late Chairman of the Forex Family of Companies, Teodoro "Uncle Mac" M. Carino Jr. who remains to be our inspiration for delivering timely service to our customers. Our workforce in the Philippines has over two decades of experience in the processing, handling, and delivering of balikbayan boxes from 14 countries all over the world to the Philippines. Is to handle and deliver your balikbayan boxes in a safe and timely manner, and to be the most dependable delivery link between all Filipino overseas and your loved ones in the Philippines. With UMAC, you are assured that from pick-up to delivery, your box is only entrusted to the UMAC team and no 3rd party contractors are involved.